"We have been through most of your website and it has helped educate us a great deal. I found it the best source of information about so many common fireplace questions, all thoughtfully answered. Thanks for hosting such a great site!" In the last few years, many regulations and quarantines have been put into place that restrict the movement of firewood. Movement of firewood across the USA-Canada border, for instance, is now restricted very closely. Many states and counties in the USA, as well as some of the provinces and regions in Canada, now are under quarantine for wood products like cut firewood. While these changes may be frustrating for firewood cutters, distributors and customers, they are crucial for the protection of North America's trees from invasive forest insects and diseases. Asian longhorn beetleBut why is moving firewood such a bad idea? The answer is simple; invasive tree-killing insects and diseases can lurk in firewood. What land managers and scientists have come to understand is that these dangerous pests rarely move very far on their own, but when people move infested firewood the problem can jump hundreds of miles. The trouble is that infestations can be surprisingly subtle, and even the experts can't always see a couple of pin-head sized insect eggs, or a few microscopic fungus spores, in a pile of wood. Even wood from your own backyard or woodlot, with no quarantines or pest alerts in your area, could be host to an undiscovered insect or disease. Pest infestations can take years to be recognized by the authorities- sometimes trees appear perfectly healthy for years despite harboring harmful organisms. By the time a tree looks sick, or the quarantine is announced, you could have spread the infestation to the forests near your family's home, vacation cottage, favorite ski area, or secluded hunting cabin. 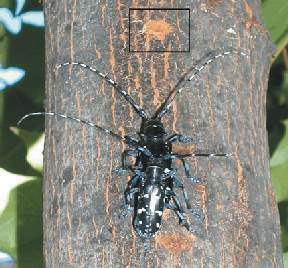 For instance, the Asian longhorned beetle infestation recently discovered in Worcester MA was at least ten years old when it was finally found. Authorities now know that these beetles had infested over three thousand trees before the beetle was reported by an observant citizen. 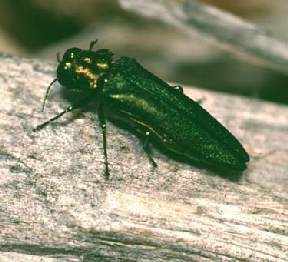 Emerald ash borerBecause foreign bugs don't have any predators or natural defenses to stop them, they reproduce really fast and become out of control, killing trees in their wake. Right now, new infestations of non-native insects are destroying forests, property values, businesses, and costing both the US and Canada huge sums of money to control. Slowing the spread of these dangerous pests by cutting, distributing, and burning firewood locally is incredibly important. As an informed firewood user, now you know not to take any unnecessary chances with your wood supply. You don't need to burn less – you just need to buy the wood as close to where you burn it as possible. Using a firewood supply that was harvested from just down the road, or at least in the same county, will help both your local economy and will protect native forests. Invasive insects and diseases can be unwittingly transported in even the cleanest looking firewood, and the health of our forests depend on people like you making the right decision – to buy it where you'll burn it. This article was provided to us by Leigh Greenwood of the US-based project Don't Move Firewood. You can find more information at Don't Move Firewood.